I don’t think I can discuss Drifter without talking about Fez. 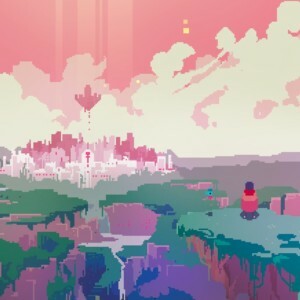 Like that game, Drifter is a pixelly, atmospheric exploration game with a soundtrack by Disasterpeace. Like that game, Drifter has a set of civilizations on floating islands that you understand in part through a set of hidden carvings and a secret alphabet. Like that game, Drifter uses glitches that break the normal visual style of the game to symbolize fragile reality. Like that game, Drifter contains secondary objectives that are harder to find and understand than the main challenges of the game. These two games are part of a larger canon that is exploring the same concepts. Look also at Secrets of Rætikon or Sword and Sworcery or Titan Souls. Game creators are looking back at a collection of ingredients from the past and using them intentionally instead of out of necessity, like how high French cuisine arose out of lower-middle-class dishes. The inscrutability of many Nintendo games wasn’t a fully intentional choice; it was the result of the system’s restricted memory and poor text support. Indeed, the manuals tend to contain detailed backstories that disrupt the feeling of mystery. Drifter is often described as similar to the Zelda series, but that comparison falls apart upon close examination. Yes, it is a top-down game where you explore distinct regions, fight bosses with a sword, and collect weapons and upgrades. However, the distinctive conventions of Zelda are missing. Upgrades don’t serve to gate areas to enforce a linear path through the game. There are keys, but they are an optional side collectible, not a basic way of structuring dungeons. Drifter has an overworld and an underworld, but they are interconnected instead of isolating the underworld into discrete dungeons. The Zelda comparison (or more bizarrely, Diablo) is facile and, upon consideration, not particularly useful. Instead, think of it like this: Drifter examines how past games have done things. It takes the hidden-in-plain-sight exploration from Zelda. The combos and dodging from Platinum. The conquest weapons from Mega Man. The push-and-pull of gun ammo and swordplay from… where? Maybe from whole cloth. It combines these together and becomes its own work. This is a game with new things to say, but it refuses to speak them out loud. Screenshot from Steam user *Killy*. Is this a hard game? Yes. It is very hard. However, it is a game that becomes much easier once you figure out a few of the things it wants you to learn. The fact that it refuses to tell you outright is what makes it hard. Does this make it a Dark Souls? Maybe, but I think instead it and Dark Souls are channeling the same (only slightly obstinate) rebellion against the hyper-refined tutorial style of the Valve and EA schools of design, where hovering text or manipulative level design ensure you never get lost or have the opportunity to reach your own revelation. Does this mean it will leave people behind? Yes, including literal professionals. The game seems content to alienate many of its potential players. However, there are three major lessons that, once you learn them, make the game open itself to you (and vice versa). At the beginning of the game, three regions are open to you: the north, the west, and the east. Each has distinct enemies and each has a boss at the end. Each has a single teleporter, closer or further from the boss, which lets you return there at any time. At the beginning of the game, it is theoretically possible to reach and defeat any of the three initial bosses. Theoretically. Most games teach us that when you enter an area or level you are expected to beat it before going elsewhere. This isn’t a good way to approach Drifter. The later fights in each area, especially the bosses, are hard. Unless you have astonishing reflexes, you will not be able to beat them if you’re proceeding linearly through each area. Instead, you should explore each area at least enough to reach each teleporter, then branch outward, exploring side passages and collecting the yellow “gearbits” that serve as currency for upgrades. Every2 hidden path is marked with a symbol on the floor or a visible, apparently-unreachable platform nearby. Collecting this currency lets you buy essential upgrades, and the fights you have along the way will train you in the game’s combat rules. 2. It’s about timing and patterns. Unlike a Zelda or similar slashy action game, continuously attacking and staying on the offensive will not be easy. Your damage can be dealt in combos of three sword swings, you have dramatic evasive abilities, and enemies attack rarely but for significant damage. Fighting is not about killing as fast as possible to make your rate of damage dealt exceed damage taken. It’s about finding out when you are strong and when you are vulnerable and acting accordingly. I don’t consider myself particularly talented at video games, although I suppose I have a great deal of experience. I found the game infuriatingly challenging for my first several hours until I started thinking of the fights in terms of attrition and combinations of attacks. 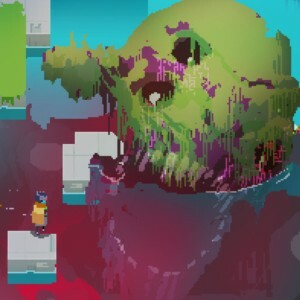 Slash, slash, slash, retreat: this is the rhythm of Hyper Light Drifter. “Getting greedy” is how you take damage. Taking damage is nearly never necessary. The upgrades available for sale in town initially seem minor. Adding extra options to already frantic-feeling combat is not a compelling sales pitch. However, these tools are essential to becoming more survivable. Increasing your healing item slots from three to five nearly doubles your ability to store health items and survive damage. The grenades you can buy provide much-needed crowd control and recharge over time instead of via sword slashes, which makes them essential when resources are low. The ability to chain dashes lets you retreat much more effectively. The ability to reflect bullets with a sword slash turns clouds of projectiles into an opportunity instead of sudden death. You don’t get more max health in this game until you’ve basically beaten it. Your sword slash never does any more damage. Instead, you gain abilities that let you deal with circumstances that were previously deadly. Should Hyper Light Drifter actively teach these things, instead of leaving them out for you to stumble upon in the wasteland? This isn’t “To the Right, Hold on Tight.” The game doesn’t test to make sure you understand these lessons or even really give you a focused opportunity to learn them. You can easily reach (and die repeatedly on) one of the initial bosses without ever learning one of these… and it’s not your fault for missing anything. Learning these lessons feels great. But is it worth it, coming after so much frustration? Is it worth losing so many potential players? Screenshot by Steam user Nojafox. Dark Souls, again. Some people don’t get to “get good at” Dark Souls — because they lack the necessary background in similar games or in basic controller operations, because they lack talent in recognizing patterns and tactics under pressure, because they have a real physical or mental disability that already limits their access to many other things in life, or just because it’s not worth the time or effort to get the potential rewards. Should Dark Souls have an easy mode? Yes. Absolutely, yes. 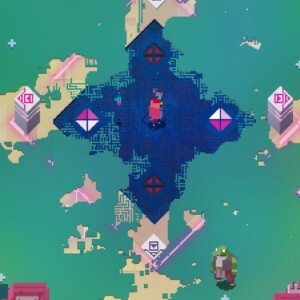 Should Hyper Light Drifter? Probably. A few extra health boxes and some more forgiving combo timing would make Drifter as challenging for the people I mention above as it was for me. People come to games with different skill levels and everyone deserves to experience a game as intended. Challenge is not one-size-fits-all. But an easy mode wouldn’t resolve the problem with the lessons that Drifter refuses to teach. “How did you do against the first few undead up the stairs?” I asked. Looking at your environment, identifying what is and isn’t navigable, and figuring out how to get from here to there is a core technique in those games and it’s one that the games don’t really teach you. After I showed him where the stairs were that led to the Undead Burg, he went on to love and complete the entire series. The game that Drifter most feels like is Shadow of the Colossus. It’s a game that, while it has standard tutorial prompts and structure, evokes the same feelings of openness and immediacy as Drifter. After long periods of wandering, often unsure if you’re headed in the right direction, you’re suddenly confronted with battles that appear, at least aesthetically, to be impossible. However, by applying what you’ve learned, you can overcome these challenges. If Drifter took the Colossus route, telling you its secrets outright and guiding you to its challenges in a set, achievable order, it would lose its strange, unsettling confusion. There’s value there, in its ambiguity and its coy shrugs. In Shadow of the Colossus, you feel bad for killing the Colossi but know that there was no other way to proceed in the game. The game holds you as you weep and reassures you that this was necessary. Not so, in Drifter. Drifter has a downer of an ending.4 When you finish, there’s at least some ambiguity: is there another way? It told you so little, demanded you figure things out on your own. What if you collected more than the four required triangles in each area? What if you collected all the keys? All the monoliths? The outfits have undocumented, still not-quite-understood benefits; is there one that changes the ending? And if you knew, if this was a game that made itself clear, would you be left with the same feeling when you were done?